The drawstring herb bags are perfect for garlic and ginger, different herbs and spices, even coffee beans. The bags retain the ingredients' aroma and they look absolutely lovely. Plus, it all comes in a really stylish box, making this set a nice housewarming gift. Doesn't work all too well with a dishwasher machine. 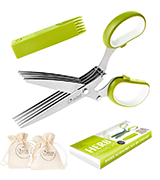 Chefast Herb Scissors Set doesn't just make things easier and more effortless. With this set, you'll be able to better showcase your culinary skills. That being said, you don't have to be a culinary genius to put the set to good use. The shears will allow you to garnish with efficiency and finesse. You can use them, among other things, to snip cilantro in perfectly sized pieces onto plates and pans. With the cleaning comb, one quick swipe is all it takes to remove the most clinging herbs. The handle has a specific smell to it at first. 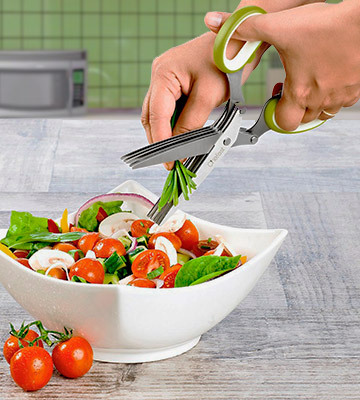 These heavy-duty herb scissors from Jenaluca will allow you to cut the meal preparation time in half. You'll be able to retain herb flavors and their health benefits. The scissors will let you mince fresh or dried basil, parsley, cilantro, and herbs de provence. The model has a comfortable silicone handle that gives you an easy but firm grip and a lightweight design that doesn't put much of a strain on your wrist. 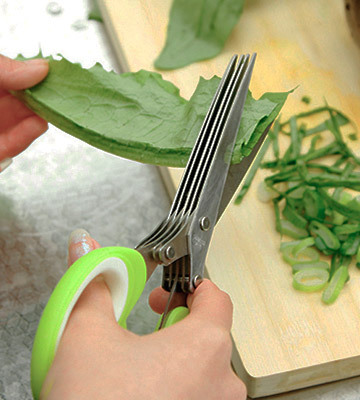 You can use these scissors to snip herbs directly onto salad leaves, casseroles, pizza, dip, basil fresh, soups, and other food. The stainless steel isn't rust-resistant. 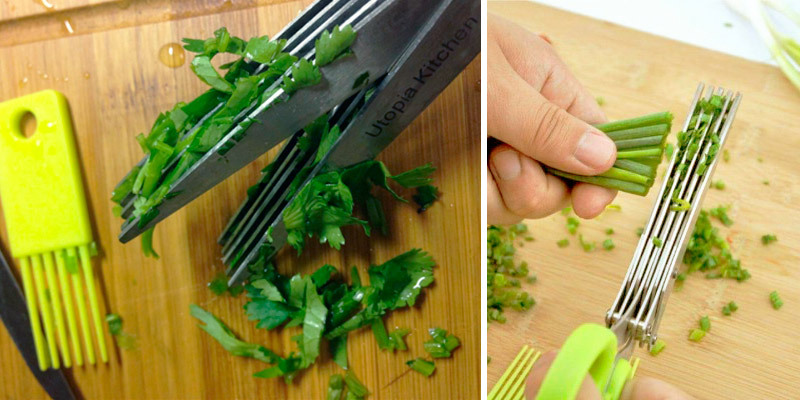 There's a lot that you'll be able to do with these Chuzy Chef multipurpose herb scissors. With them, you'll be able to prepare lots of different but always healthy meals. Expanding your culinary horizons has never been this easy. 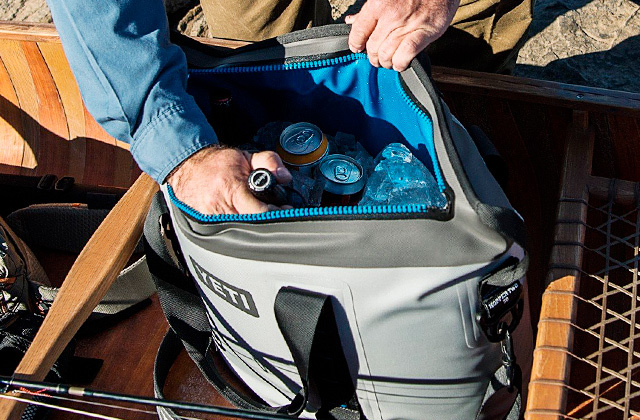 The model comes equipped with heavy-duty steel rivet that securely holds the 5 sharp blades together for consistent performance. The whole thing is completely dishwasher safe, including the protective cover that doubles as a cleaning comb. The blades lose their sharpness over time. 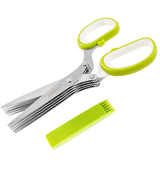 We would recommend these cutting scissors from X-Chef mostly to people who like to treat themselves, their friends, family members to wholesome homemade healthy meals. Plus, they make a really good gift. 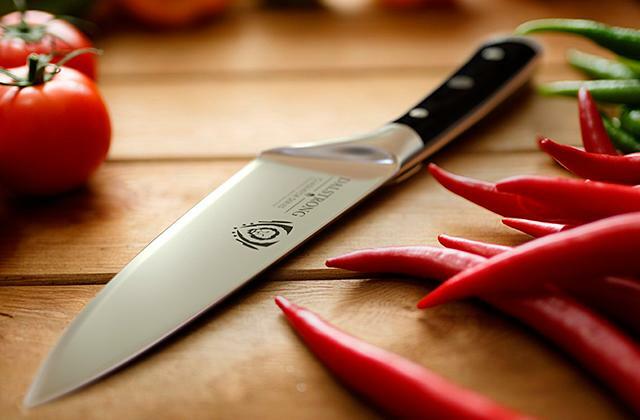 The high-quality 420 stainless steel blades are really sharp. They're 100% rust- and corrosion-resistant, so you won't have to be particularly careful with them. 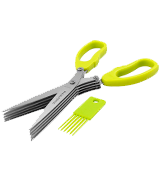 The scissors come with a cleaning comb that effectively removes pieces stuck between the blades in a single swift movement. 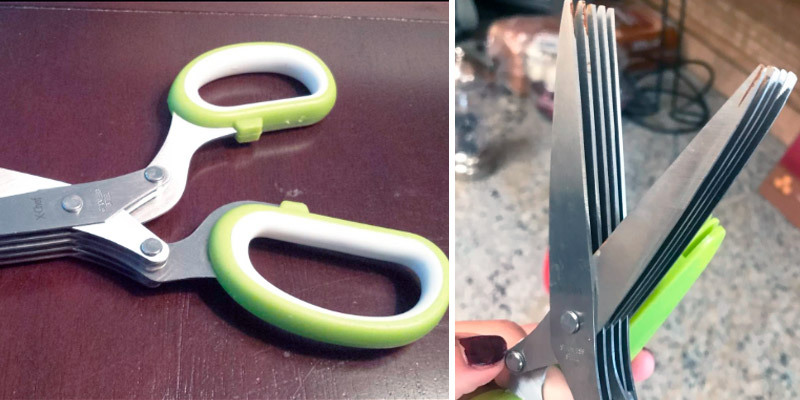 The scissors don't come with a protective cover. Utopia Kitchen presents here easily the most affordable entry on this list. Though they have a minor flaw or two, for the most part, these herb scissors are as good and effective as the next model but come at a much more modest price. The difference between this Chefast Herb Scissors Set and every other entry here lies mostly with the "set" part. 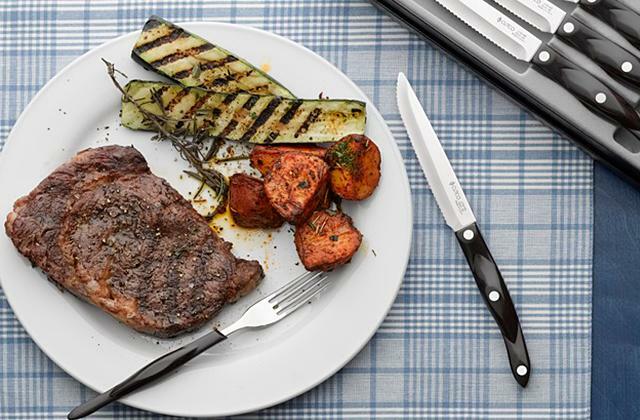 Where others supply you with a pair of shears without many extra accessories, the people at Chefast send you everything you need to prepare lots of delicious meals and salads as quickly and effortlessly as possible. Sure, there's nothing particularly new or impressive about the protective cover that comes with the package. But we can't say the same about these nice little drawstring herb bags that also come with the scissors. A small thing, sure, but these two bags are perfect for garlic and ginger, different herbs and spices, even coffee beans. The bags retain these ingredients' aroma and they look absolutely lovely. Plus, it all comes in a really stylish box, making this set a nice housewarming gift. On paper, there's nothing all that different about the blades. The high-quality steel construction should not disappoint in the long run. The 3-inch blades will be able to cut through anything with ease. With them, you'll be in complete control, serving up a small feast or making a nice little healthy meal for yourself. 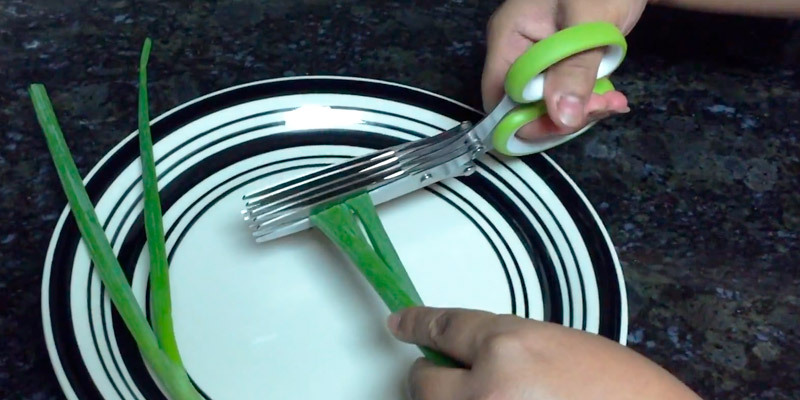 In closing, Chefast Herb Scissors Set doesn't just make things easier and more effortless. 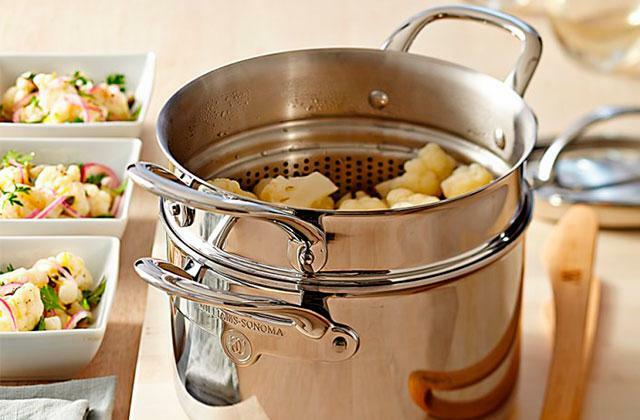 With this set, you'll be able to better showcase your culinary skills. That being said, you don't have to be a culinary genius to put the set to good use. 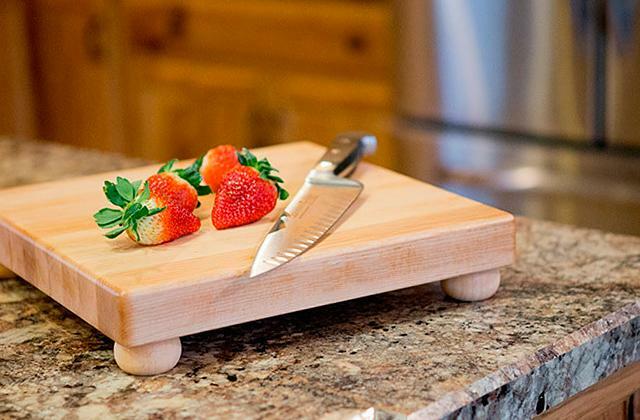 The people behind Jenaluca advertise this particular product as a kitchen tool that will allow you to save time and hassle and, as far as we're concerned, that is an understatement. With these scissors, there will be no tedious chopping. A couple of snips with their sharp, finely balanced 5 blades practically equals 10 knife chops. Of course, it isn't just about effectiveness either. Using these shears, you'll be able to prepare literal herbal confetti. They will allow you to garnish with efficiency and finesse. You can use them, among other things, to snip cilantro in perfectly sized pieces onto plates and pans. As per usual, the protective cover that comes with these herb scissors incorporates a cleaning comb. More often than not, one quick swipe with that comb is all it takes to remove the most clinging herbs. Plus, it prevents finger cuts. 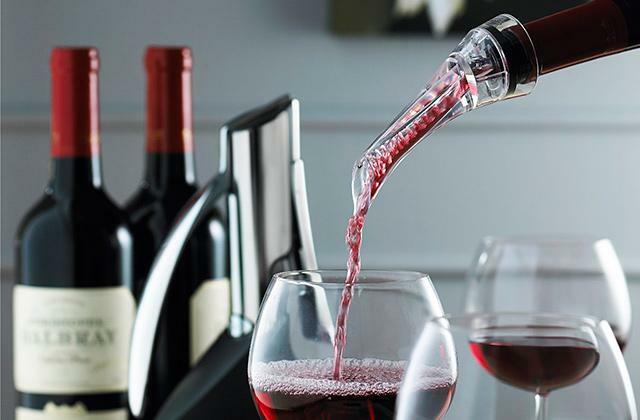 The handle, for the most part, is nice too, comfortable and ergonomic enough. We aren't the biggest fans of a specific smell that follows it but it does go away after a wash or two, so we won't hold it against the scissors. 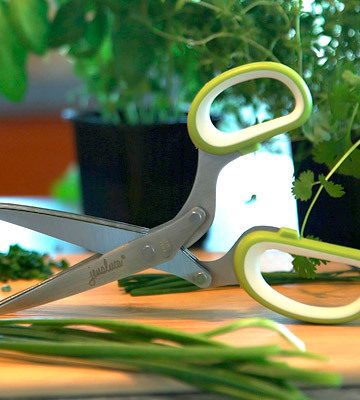 Long story short, these heavy-duty herb scissors from Jenaluca will allow you to cut the meal preparation time in half. You'll be able to retain herb flavors and their health benefits. The scissors will let you mince fresh or dried basil, parsley, cilantro and herbs de provence. 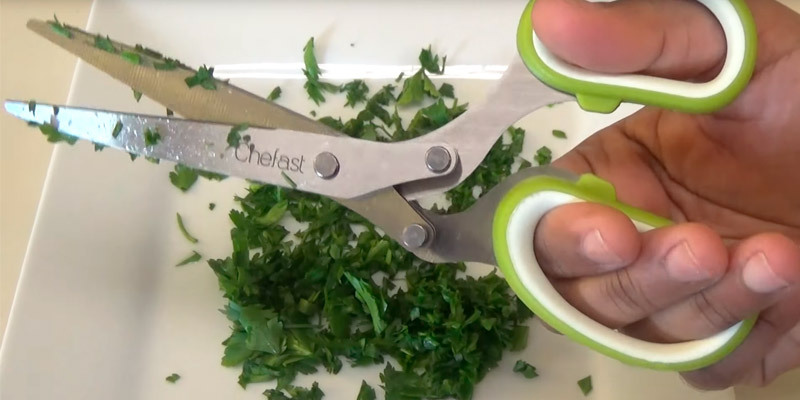 These Chuzy Chef multipurpose herb scissors have a lot going for them. First and foremost, the price isn't all that bad. They have a comfortable silicone handle that gives you an easy but firm grip and a lightweight design that doesn't put much of a strain on your wrist. The model's 5 parallel blades are sharp and sturdy enough. The only issue we have with them is that the steel isn't as rust-resistant as it can be, so you'll have to wipe them after cleaning the blades. Other than that, they are just as good as effective as the next herb shears, perfectly capable of cutting herbs without crushing, tearing, or bruising them. 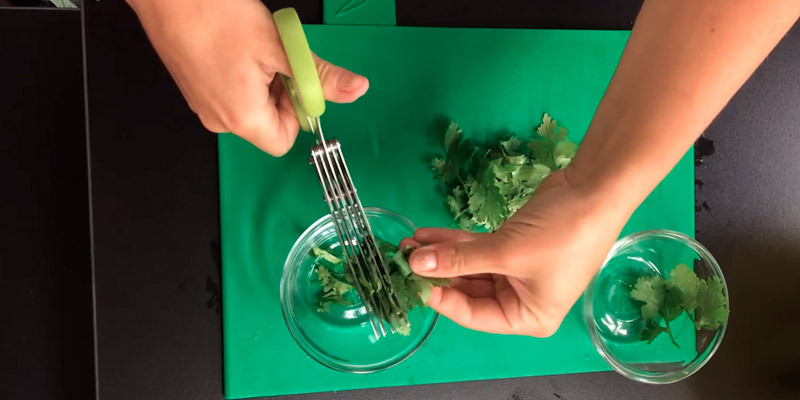 Among other things, you can use these cutters to snip herbs directly onto salad leaves, casseroles, pizza, dip, basil fresh, soups, and other food. 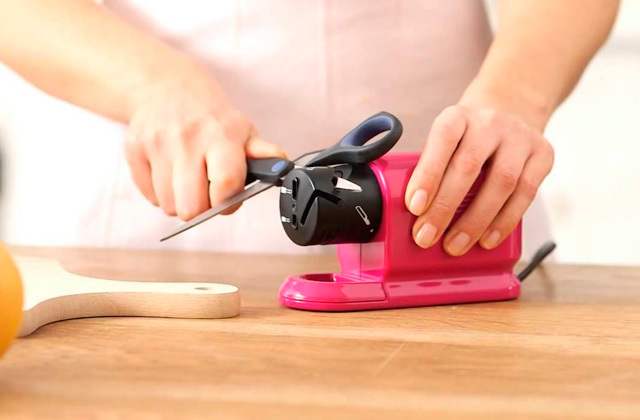 Furthermore, the model is just as suitable for cutting herbs as it is for arts and crafts or shredding paper. 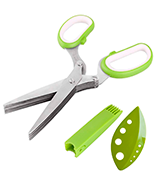 In addition to the usual protective cover, the scissors come supplied with a leaf stripper that you can use to separate the leaves from the stems. Their openings make the instrument suitable for oregano, rosemary, thyme, tarragon, and other herbs. 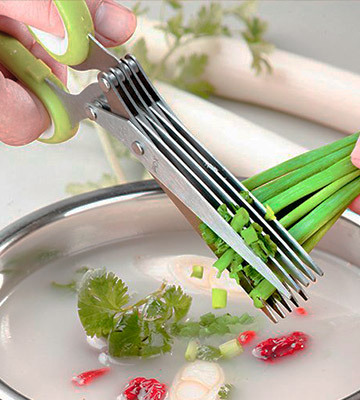 Bottom line, there's a lot that you'll be able to do with these Chuzy Chef multipurpose herb scissors. With them, you'll be able to prepare lots of different but always healthy meals. Expanding your culinary horizons has never been this easy. X-Chef Multipurpose Herb Scissors is an overall solid product that doesn't necessarily stand out but the quality build and practical construction make it a solid contender for the top spot. The model comes equipped with heavy-duty steel rivet that securely holds the 5 sharp blades together for consistent performance. Some customers complain that the blades lose their sharpness relatively quickly but that is going to happen sooner or later with these herb scissors anyway. 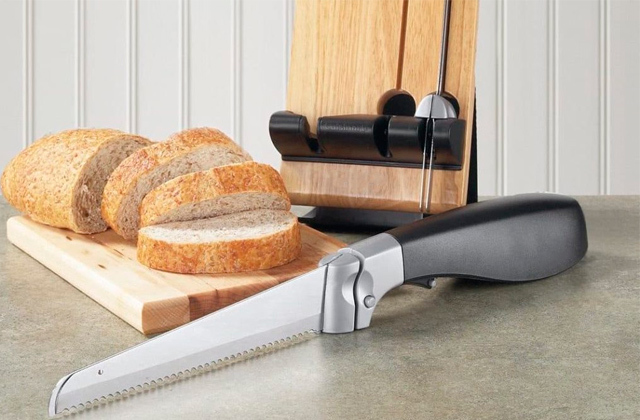 The handle is nice, with an ergonomic form that gives you that comfortable and good grip you need for cutting, mincing, and chopping. One thing in particular that we like about these herb scissors is their simplified maintenance. The whole thing is completely dishwasher safe, including the protective cover that doubles as a cleaning comb. You can use that comb to effortlessly remove lingering herbs or chives in a few swipes. All in all, the scissors are really good at/for quickly snipping fresh herbs, basils, and different chives in a perfect size onto plates. Plus, they aren't bad for cutting paper too. 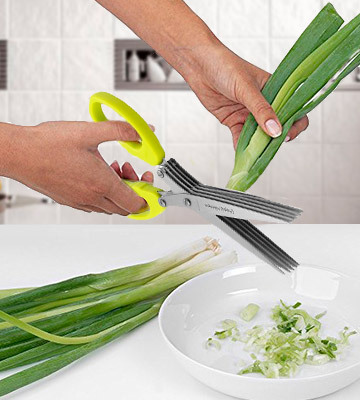 In other words, we would recommend these cutting scissors from X-Chef to people who like to treat themselves, their friends, family members to wholesome homemade healthy meals. Plus, they make a really good gift. 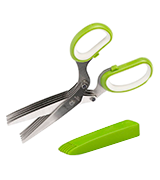 The best thing about these scissors from Utopia Kitchen is their price-performance ratio. For the most part, the model doesn't differ in negative fashion from every other product on this list but it does cost 2-3 times less compared to them. 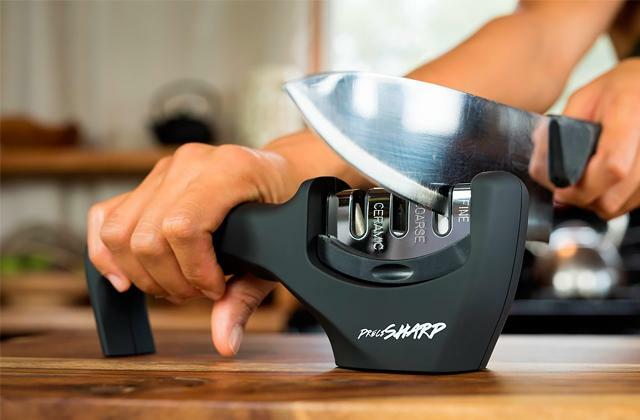 For our taste, the only real downside here is that the package doesn't include a protective cover, so it will be up to you to keep the blades nice and sharp. Apart from that, we don't really have any issues with these scissors. The high-quality 420 stainless steel blades are really sharp. More importantly, they're 100% rust- and corrosion-resistant, so you won't have to be particularly careful with them. Furthermore, the scissors come with a cleaning comb that effectively removes pieces stuck between the blades in a single swift movement. 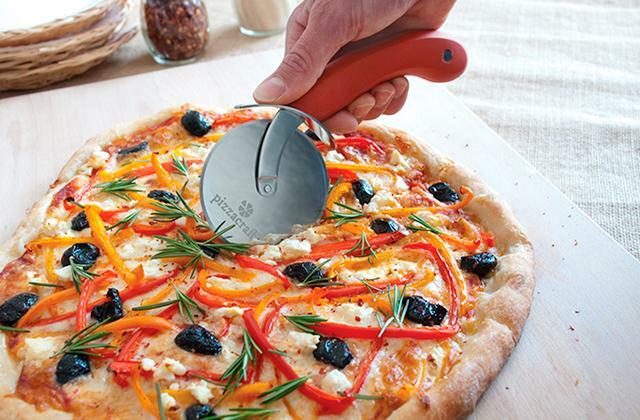 The plastic handle comes fitted with soft silicone coating, giving you a nice non-slip grip for safe chopping and slicing. As it is always the case with these scissors, the model chops herbs five times faster than any regular blade because there are 5 blades at work here. 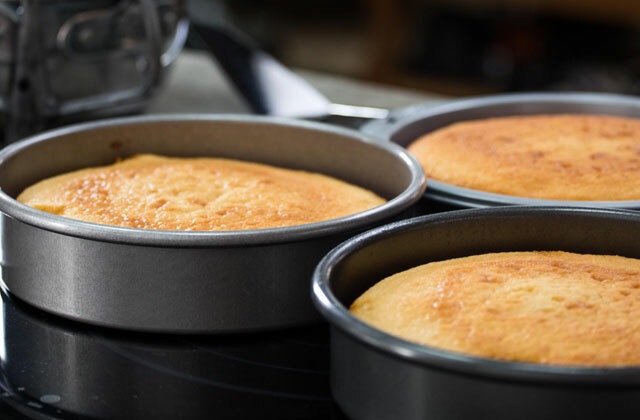 Since you're able to slice herbs directly into the pan, it enhances their taste, giving them a really nice strong aroma. To put it differently, Utopia Kitchen presents here easily the most affordable entry on this list. Though they have a minor flaw or two, for the most part, these herb scissors are as good and effective as the next model but come at a much more modest price. Every adult knows that you need to consume your greens, that's hardly breaking news. For most people, the problem is that you can't really buy a bag of greens like you buy a bag of chips and eat them right away. You have to prepare them. But first, you have to cut them. It takes time and effort and you don't always have the luxury to spare those. Well, with herb scissors, you'll be able to cut that time in half and waste practically no effort. Using scissors like that, it is incredibly easy to prepare herbs for cooking and create lovely garnishes in a matter of seconds. There are various models on the market today. But they don't differ all that much from each other. At the end of the day, what you need is a pair of scissors that is able to cut cleanly without tearing or bruising often delicate leaves. They should be comfortable enough and the blades ought to be sharp. Some might come with a different extra accessory or two like a protective cover or a leaf stripper. But that's about all there is to them. 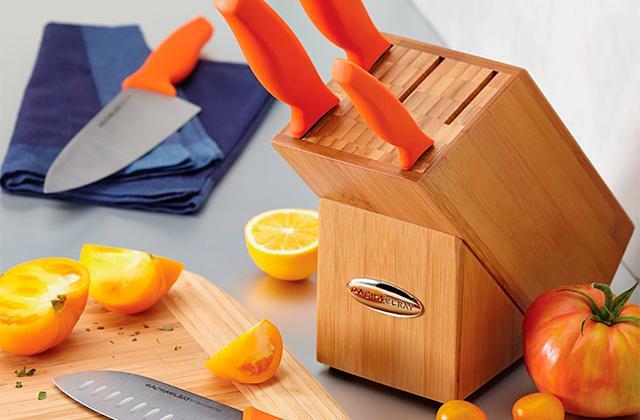 To go with scissors like that, we would recommend a new cutting board or a scissors sharpener to keep those blades nice and sharp.